The conversations you overhear in public aren’t necessarily aimed at you. But it doesn’t mean they weren’t meant for you. 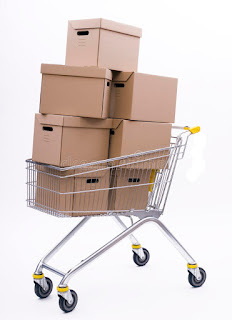 As I was entering the automatic double doors to the grocery store my mind barely registered a 40-something woman -- a store employee -- who was pushing a cart overflowing with large cardboard boxes. She had come from my right and crossed in front of me on her way out the doors. But I took more notice of the young fellow who came from my left and then followed closely behind the woman with the cart. I noticed the kid because I thought how young he looked. In that split second assessment I made as we passed in the doorway, I guessed this bagging and stocking job was his first job. He appeared no more than fifteen or sixteen years old. And he was a small 15 or 16. Bookish looking, with small horn rim glasses. Anyway, as the kid was passing me I didn't turn my head, but I heard him growl, "Box-x-x-x-xy La-a-a-a-dy" toward the woman in front of him. Then I heard the older woman giggle and say, "Ye-e-e-e-ah." Maybe Didn't Think This One Through? Part of me understands and even likes the sentiment expressed in this meme. Really, I do. 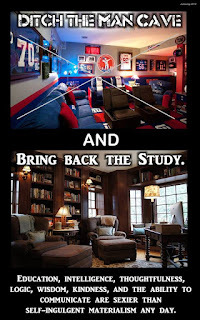 I aspire to the pursuit of all those things the meme tells me “Study” will bring me. And I admire all those traits in other people. But there's also a certain irony in the meme. An unintended irony. An irony and an audacious presumption. And a bit of an elitist snobbery accidentally thrown in. I grew up an athlete with athletic heroes. And athletic friends. Good athletes, too. At no time did it occur to me or my friends that sports were an alternative to "education, wisdom, logic, thoughtfulness, kindness, and the ability to communicate”. In fact, I would opine that sports was the very most effective avenue for a young person to arrive at “logic, wisdom, and the ability to communicate”. Sports were the effective, “do or die” world of logic, wisdom, and the ability to communicate. And if you weren’t kind, you’d better be awfully, awfully good at sports or you weren’t going to get anywhere in the sports world. And three of my friends – now successful business men – acquired their education via their athletic prowess. Yes, real education. MBAs. PhDs, even. And, not to reverse the offense here, but it was those who couldn’t be kind, communicate effectively, and weren’t thoughtful – the socially unwilling – who were the very ones huddled away in their “study”. 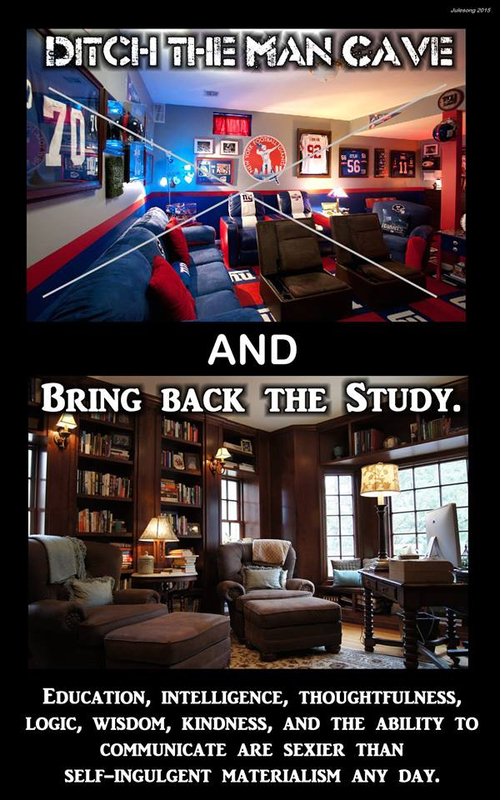 I can’t help but notice that the “study” pictured in the meme appears to be the den of a multi-million dollar home (or a Decorator/Fashion Magazine). The image smacks of "study" to exactly the same extent that (for instance) Pierce Brosnan effects by donning horn rimmed glasses. Which is to say, "not at all". So, maybe I misunderstood the meme. Which room in the photograph represents the self-indulgent materialism? My “study” is a corner of my pottery shop. No leather chairs. No leather bound books. And my window looks out on a hay field that’s next to a railroad track that’s next to the town’s biggest industry – an orthopedic manufacturer. Not a manicured lawn in sight. So, maybe what the meme is saying is that if I’d pursued the right kind of education, wisdom, thoughtfulness, kindness, and ability to communicate, then that multi-million dollar study could have been mine? I guess there’s logic in that. I'd suggest we discuss it over over a few beers....but that, of course, tips my hand as well.